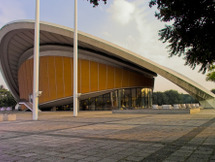 House of the World's Cultures (Haus der Kulturen der Welt - HKW) in Berlin is Germany's national centre for the presentation and discussion of international contemporary arts, with a special focus on non-European cultures and societies. 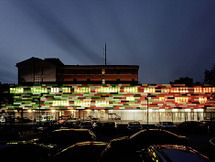 It presents art exhibitions, theater and dance performances,.. 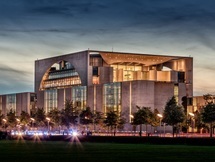 The spectacular architectural ensemble of the new German Chancellery was designed by Berlin-based architects Axel Schultes und Charlotte Frank during the time (1982-1998) when Chancellor Helmut Kohl was in office. It is one of the most impressive structures in the newly created government.. It is a residential building for Bundestag delegates and for federal staff in Berlin and it is part of the Moabiter Werder complex. They were created as a result of a competition of 1995. Although the draft of the Berlin architect Georg Bumiller did not receive the first prize, but only a.. 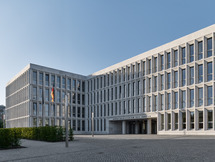 The Federal Ministry of the Interior design by Mueller-Reimann Architects cover a broad range of tasks and activities, extending from civil protection, integration and sports funding to security. Since 12 July 1999, Berlin has been the designated primary location of the Federal Ministry of.. The new station housing the police and fire departments for the government district of Berlin is an extension to a now free-standing 19th-century structure. Located on the edge of a former goods yard close to the river Spree. The single-banked rear wing of the building serves as a backbone.. The site of today's Moabiter Werder has been the property of the city of Berlin since the 13th century. 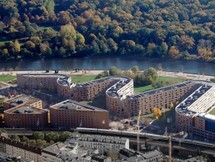 Since 1850, Moabit has increasingly settled in industrial facilities, including a shipyard on the river Spree. 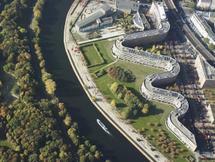 The Spree meadows, which had been essentially unchanged for centuries, had to be..